Rescue CPR is an approved American Heart Association Training Site in the Central Florida area in Orlando and Maitland. We teach both Provider and Refresher American Heart Association classes in CPR, Advanced Cardiac Life Support (ACLS), Pediatric Advanced Life Support (PALS), Heartsaver AED, and Heartsaver First Aid w/AED. 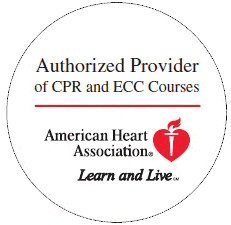 We also offer Skills Check-off for BLS, ACLS, PALS, Heartsaver AED and Heartsaver First Aid w/AED. Our AHA courses are taught by experienced, highly knowledgeable and skilled healthcare professionals and educators who have decades of practical and teaching experience. We teach in a stress-free environment conducive to learning by following AHA guidelines, which ensures that every student understands the material, coupled with plenty of hands-on practice and ultimately exceeding all required AHA criteria. In an effort to be student-friendly, Rescue CPR works around your schedule whether it is coming to our NEW office located at 1053 N. Orlando Avenue in Maitland or reporting to your workplace to conduct any requested AHA training in the Central Florida area in Orlando or Maitland.